In September 2018, with the support of the Australian Government Department of Foreign Affairs and Trade, to advance the next steps of the ‘Last Taboo’ research, the Criterion Institute and Pacific RISE arranged a four-day workshop. 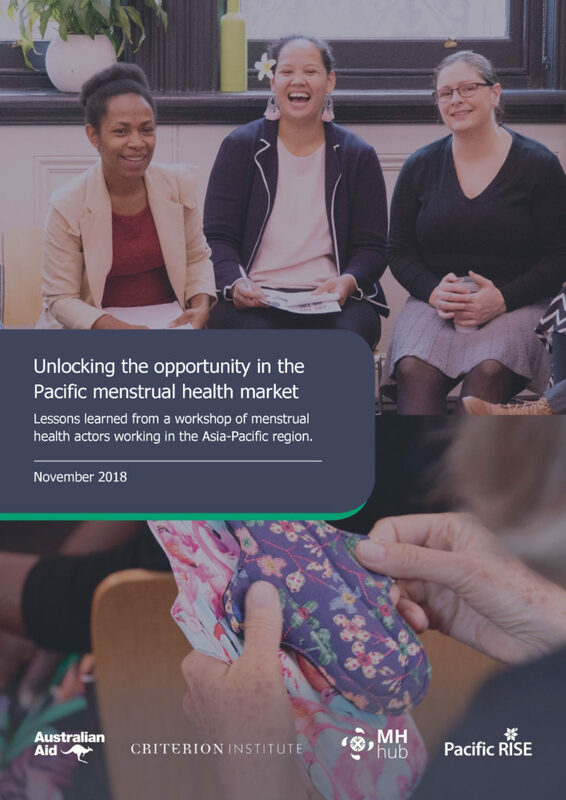 The workshop brought together a diverse range of social and business actors focused on improving menstrual health management in the Asia-Pacific region to understand and explore investment opportunities. During the workshop, it became clear that investment needs to be targeted and appropriate to both the enterprises and the market. Market growth potential exists, and for investment to be effective, investors should invest in ecosystem collaborations to expand the ability for several local enterprises to effectively and efficiently meet the menstrual health needs in their local communities. Read more about the outcomes of the workshop in the report below.